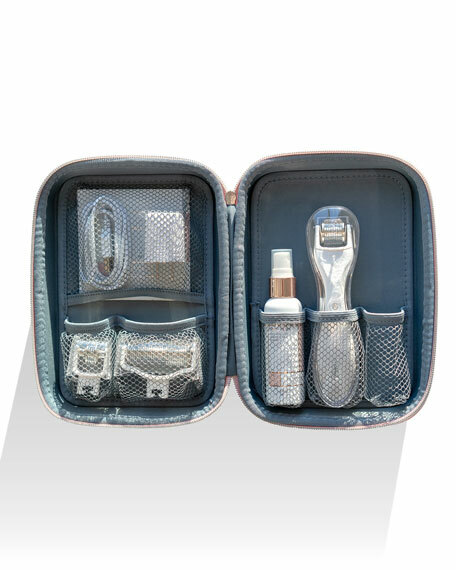 GloPRO® Pack N' Glo Essentials Set includes GloPRO® Microneedling Regeneration Tool, EYE, FACE and BODY MicroTip Attachment Heads, Pack N' Glo Storage Organizer and Skin Prep Pads. GloPRO®'s patented next-gen advancements stimulate the skin and transform your complexion's surface while amplifying absorption and enhancing the performance of your skincare. GloPRO® results are almost instant: skin is visibly firmer, softer and refined. Clinical studies prove it. GloPRO®'s patented technology stimulates skin's natural healing response to induce micro-rejuvenation deep within the skin for a visibly firmer, smoother, younger-looking appearance. GloPRO® EYE MicroTip Attachment Head is specifically designed for the hard-to-reach fine lines under and around the eye area and above the lip. 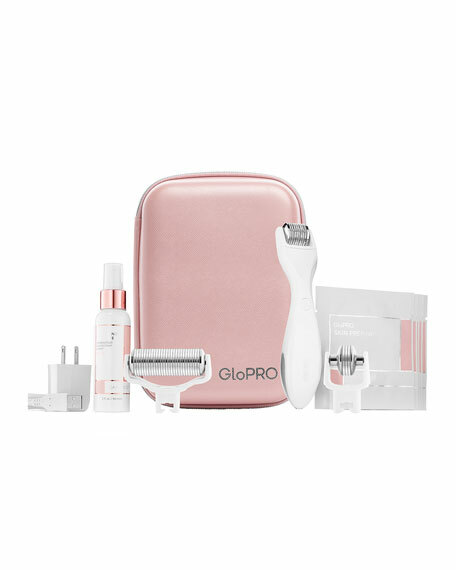 GloPRO® FACE MicroTip Attachment Head is designed to restore the skin's volume and target wrinkles on the face, neck and décolleté. GloPRO® BODY MicroTip Attachment Head is recommended for use on uneven, crepey, saggy or dimply skin on the body including thighs, buttocks, abdomen, knees, and arms. Get the most out of GloPRO® using these specially-designed and easy to maneuver attachment heads. As MicroTips pass over the skin, the rejuvenation process begins immediately as cells respond to imperceptible microchannels restoring volume from the inside out. Red LED light therapy and VibroTactile Stimulation work synergistically to enhance regenerative skin benefits. Used alone or as a companion to your favorite serums and creams, this youth-promoting tool magnifies the benefits of key anti-aging ingredients by maximizing skincare absorption. 97% reported an improvement in skin's firmness. 100% felt GloPRO® helped stimulate their skin's natural collagen. 93% saw an improvement in the evenness of their skin tone. 90% would consider GloPRO® an alternative to cosmetic fillers. Results from a clinical study revealed GloPRO® reduced nasolabial fold wrinkling by an average 29.5% after just 30 days of use. Use GloPRO® after nighttime cleansing. GloPRO® should be used on clean skin. 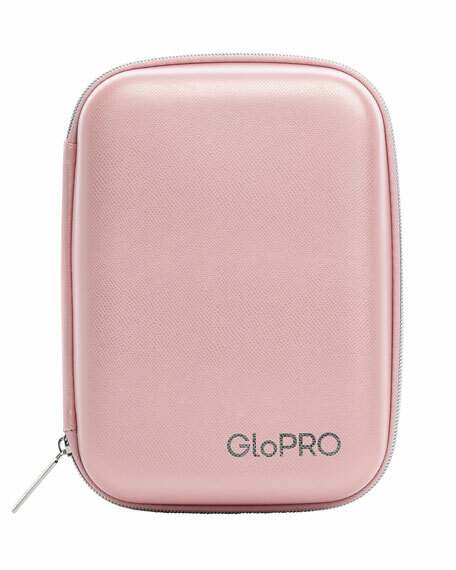 GloPRO® Skin Prep Pads are recommended for use prior to GloPRO® treatment. Use gentle pressure and roll GloPRO over each area 4-10 times, changing direction with each pass. GloPRO® should be used for at least 1 minute to ensure skin has been properly stimulated. Skin will appear pink or flushed after using. Apply your favorite serums, creams or treatment products within the first 60 seconds after use while microchannels are active and ready to receive key anti-aging ingredients. GloPRO® is recommended for use at least 2-3x per week but may be used nightly. MicroTip Attachment Heads are designed exclusively for use with GloPRO® and should be replaced every three months with regular use. At BeautyBio, we believe in bringing truth to beauty, which means total transparency. Our origins at the lab helped us create highly developed formulas backed by science and a thirst for cutting-edge technology. Female-owned and people-minded, BeautyBio strives to empower others through skincare because we believe beauty can change the world one confidence boost at a time. While you're busy being boss babes (and guys) building your empire, we're committed to making sure your skincare routine remains easy, effective and stress-free.